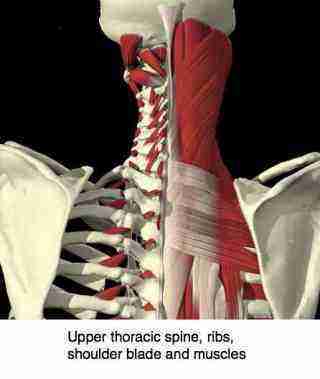 Thoracic spine pain is rarely serious but often very irritating. Thoracic spine pain is rarely serious but frequently very irritating. This page was last updated by Dr Barrie Lewis on 8th December, 2018. Metastases from known malignancies of the lungs, prostate and breast should be kept in mind, but they are very much the exception that proves the rule. There are twelve thoracic vertebrae, each attached via three joints to a rib bilaterally; thus six in total. They are then connected to the breastbone anteriorally. The midback stretches from the base of the neck to the bottom of the ribcage; that's about a hundred in total. 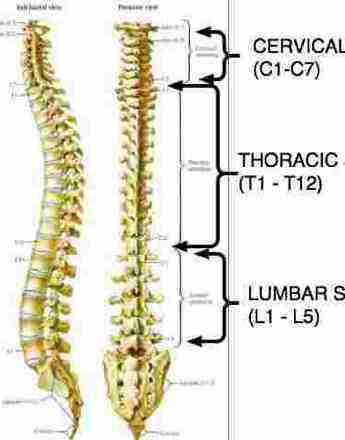 This means that each thoracic vertebra has twelve joints associated with it. Two facets with the vertebrae above and below. 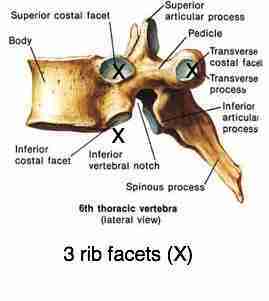 Six costo vertebral joints between the vertebra and the two ribs. That's a great many, each with supporting ligaments and muscles, making it a complex and frequently painful area. The mid back is far stronger than the neck and lumbar spine because of the stabilising effect of the rib cage. Nevertheless, a good sneeze, particularly if twisting at the time, or a bout of bronchitis may subluxate or sprain one of those joints causing severe pain with each breath. It feels like someone is stabbing you in the back with a rusty knife. 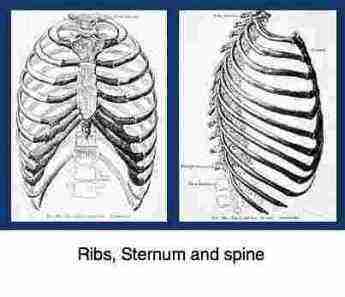 Each vertebra is attached by a rib to the breastbone, sternum, thus giving the whole chest a certain rigidity. This makes it far less liable to the serious disc injuries associated with the neck and the lower back. Do you love to read? Chiropractor Bernard Preston tells many light fascinating stories about chiropractic. At the centre of attention in these stories are ordinary people, with all their idiosyncrasies and quirks. What they have in common is the search for better health. Funny and healthful, is how preston's books have been described by a fan. Modelled on the famous James Herriott, the vet in harness, Preston's stories are mostly light, giving insight to the chiropractic coalface. Of course, occasionally tragic things happen in the practice. Right now I'm treating a very elderly lady. Twenty years ago I had to break the news to her husband that his thoracic spine pain was caused by multiple myeloma. Read Bats in my Belfry and Stones in my Clog on your Kindle or smartphone. A snip at $2.99 each. Father Time; enjoy a free excerpt. 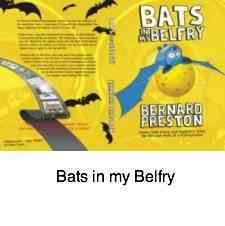 Bats in my Belfry by Bernard Preston, only $2.99 on Amazon. Thoracic spine pain is the most frequently adjusted area of the spine by chiropractors because of the effect it has on the internal organs. Always important for every chiropractor treating a woman with thoracic spine pain is breast cancer and prevention; of particular importance is the role that lignans play in the diet. I have a friend right now dying from prostate cancer that has metastacised to the thoracic spine; it's unusual and mystified his doctors for over a year; I'm glad he never consulted me! Men of our age didn't know in their youth the importance of tomato prostate. Why do we hiccup is a question ususally asked by the mothers of infants; it can be very disabling in tiny tots. But it can be problematic in adults too very occasionally. Seen from the side, the thoracic spine has a natural curve called a kyphosis. This "kyphosis" provides the spine with a certain amount of 'give' when for example jumping from a height onto the ground. A straight spine would experience too much axial compression, and fracture the bones. 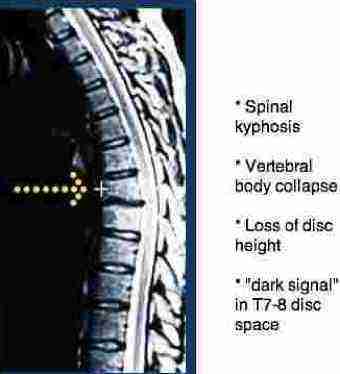 However, the kyphosis can increase for pathological reasons causing thoracic spine pain. The most common is the so called kyphotic, bent, spine of the elderly. It is usually associated with osteoporosis and anterior wedging of the vertebrae, as seen in this MRI of a spine with an anterior compression fracture. For more on the causes of osteoporosis, use the search this site facility. Scheuermann's disease is a fairly common condition causing an increased kyphosis, starting in the teenage years. It results in pain usually between the shoulder blades, and less commonly in the low back, and is the cause of the poor posture and slumped shoulders seen in about five percent of young people. What is quite often seen in the practice, in young to middle aged adults, is a Scheuermann-like thoracic deep achy pain. The structural changes, and abnormal cartilage make the spine very stiff. Adjusting the midback feels like thrusting into concrete, and a hard physical manipulation just increases the pain. What's needed is more frequent gentle adjustments. It has many of the hallmarks of Scheuermann's disease; a stiff and rigid thoracic spine with an increased kyphosis. Sometimes there is a scoliosis and loss of disc space with mild degenerative changes, but without the typical bone changes associated with the disease. I call it a form of Scheuermann's Light, as it has so many similar clinical features, but without the gross xray changes, and is managed in much the same way. All disease seems to come in severe and mild forms. Thoracic spine pain is common, and this condition can never be cured. An occasional, but regular treatment is what keeps the pain at bay. How frequent? Talk to your chiropractors. There are so many variables; perhaps four to eight weeks. There are often objections to regular chiropractic treatment. It's no difference in medicine; patients with incurable diabetes, for example, require regular occasional management by their doctors. If these joints are not brought into movement, then the hyaline cartilage, starved of nutrients and oxygen, degenerates and on xray it just looks like typical osteoarthritis. A stitch in time, or, in our context, an occasional, but regular chiropractic adjustment in, saves nine barrow loads of thoracic spine pain. Hyaline cartilage the second most important page at this site! The first? The osteoporosis page above. Tietze's syndrome causes pain around the breastbone. in front, to the breastbone, may cause costosternal chest pain. Both of these joints, at the back between the shoulder blades, and in front at the breastbone are common cause of thoracic spine pain seen in every chiropractic clinic. Sometimes, if it irritates the intercostal nerve, it may follow the rib to the sternum. Rib pain treatment is often necessary when every breath causes sharp pain in the midback, often after an sudden, unexpected shower of sneezes. This latter condition, sometimes called Tietzes syndrome is quite often, if it affects the ribs on the left, confused with a heart attack because the pain is directly over the heart, and may be increased wih exercise which stresses the heart, as in angina, but also the rib sternum joint when breathing deeply. What may catch any chiropractor out, in it's early stages, and presumably your medical doctor too, is an attack of shingles. 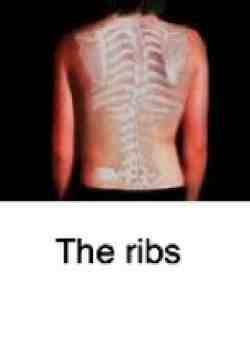 This is a viral condition causing a nerve type pain that follows the rib. After a few days the vesicles appearand his her face will be red! But I've never had a case of shingles that I've treated inadvertently, that has gone on to become a chronic nerve pain, as can happen. Thoracic outlet syndrome is an irritation or frank pinching of the plexus of nerves, after they have left the spine on the way to the arm. The nerves and artery pass through the narrow inter scalene triangle. The upper thoracic spine is a unique area for two reasons. Firstly, it is an area of change, where the highly flexible neck meets the very rigid mid-back. The C6-T2 area is thus very prone to injury and tingling or pain in the arm. If it involves a fixated first rib and subsequent scalene muscle spasm, then it's known as a thoracic outlet syndrome; there are other causes. The second reason is the presence of the shoulderblades or scapula(e). These large flat bones are the anchor points for many of the large shoulder muscles, shoulder anatomy and are themselves firmly anchored to the thoracic spine. Deep upper back pain is sometimes cause by a pinched nerve in the neck. As you can appreciate, there are a great many muscles, ligaments, joints and bones in the mid-back. The injuries associated with them are not usually serious, but are the cause of many niggling, aching pains between the shoulder blades. Chest pain is an enigma that demands careful attention. Even more trying is deep upper back pain where the underlying cause can be in multiple sites. Very occasionally, depending on the society, bacteria may attack the spine. It's a favourite nesting place for people suffering from acquired immuno deficiency syndrome and tuberculosis. More rarely, an epidural, such as is commonly today used in childbirth, may introduce bacteria to the spinal fluid, where they are free to travel. A recent case, was a puzzler for all concerned. Inspiration pain, but bilaterally. A sprung rib commonly causes pain with deep breathing, but it's unilateral; on one side only. Extreme pain on using a hyperextension technique. They are rarely painful; when they are, it's a sign for your chiropractor to look further. She's doing okay, all things considered, but despite extensive antibiotic treatment, the vertebra has crumbled. 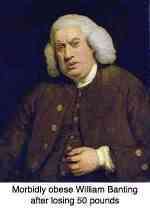 Even the commonest medical procedures occasionally have devastating side effects. Doctor caused disease is the third most common illness in developed countries like the United States, mostly from medication. Metastatic bone disease is fortunately an uncommon finding in chiropractic practice, but a case could walk in tomorrow; no doubt we miss them sometimes, especially since chiropractors are taking less xrays since the Lancet report that 7 percent of cancer is caused by ionising radiation. Both lung and breast cancer have a tendency to metastasise to the ribs and thoracic spine. All doctors, and chiropractors especially, need to be aware that an abnormal presentation, particularly if there is a history of smoking or breast cancer, may indicate something other than routine spinal subluxations. A scoliosis or curvature of the spine must be caught early before permanent deformity happens. Chiropractic treatment for scoliosis in particular calls for a long look at the short leg syndrome, and a lifetime of exercises.